Come and get it. More cash to win here, or at least a Visa gift card. Open worldwide, you have through 4/21 to enter to try to win. Good luck. This event is hosted by: Lil' Blog and More, Coupons and Freebies Mom, and On Honeysuckle Hill. 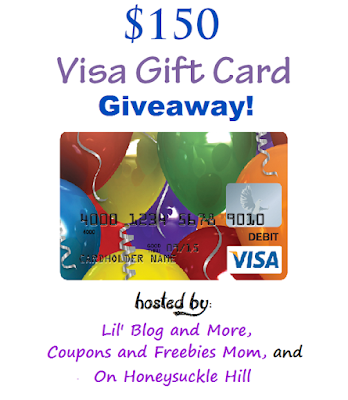 One lucky winner will receive a $150 Visa Gift Card. Disclosure: The bloggers involved in this giveaway were not compensated, and are not responsible for prize fulfillment. Lil' Blog and More will be sending the prize out. Must be 18 years of age or older to enter this giveaway. This giveaway starts March 23, 2017, and will end on April 21, 2017 at 11:59 pm. The winner will be emailed, and have 48 hours to respond, or a new winner will be chosen. Once a winner is drawn and confirmed, the name will be announced on the GiveawayTools form. Open to Worldwide entries. We just moved into a new house so we need to buy things like towels and shower curtains. This would help with groceries and other items needed for the house. If I won, I'd use the money for a weekend get away for the hubster and I! I would probably spend it on my kiddos, they are always needing something! They deserve it though, they are really great kids so i don't mind. I would buy myself a pair of jeans too.